To ensure delivery of this newsletter add almanac@ypi.com to your white list or e-mail address book. See what activist and author Bill McKibben has to say. Who doesn’t love a free gift?! Plus, see what our friends at YankeeMagazine.com and NewEngland.com are giving away! With gardens and farmers’ markets filled with fresh vegetables, there are many wonderful, healthy dishes you can make to enjoy the bounty of the summer. A refreshing cold soup for a hot summer evening. A wonderful breakfast dish, made on top of the stove, that can also be served as a lunch treat. This festive salad is a perfect side to grilled meats or fish. If you have a surplus of green tomatoes, try this easy recipe and enjoy the very special flavor. For more summer recipes, go to our Recipes pages. We hope you found this newsletter “new, useful, and entertaining” – just like The Old Farmer’s Almanac. Thanks for reading and sharing it. Feel free to forward this message to a friend. If you do not wish to receive our regular e-mail newsletter in the future, please click here: unsubscribe. Or you can reply to this e-mail with the word “unsubscribe” in the subject line. A porch with a rocker or two is a friendly and welcoming place. But more than that, a rocking chair invites us to slow down, relax, and enjoy life. P.S. Please visit our blogs about everything Almanac. Comment on random reflections, advice, and ideas from the editors of The Old Farmer’s Almanac. St. Swithin was a beloved 9th-century bishop of Winchester who requested that he be buried in the churchyard — some say to be closer to the common people, whom he loved; some say so that he could enjoy God’s gift of rain for all eternity. When he died in 862, his request was honored. About 100 years later, however, it was deemed unseemly that so holy a man should rest in a common grave. On July 15, the saint’s feast day, an attempt was made to enshrine his remains in his church. However, legend has it that St. Swithin caused torrential rains to fall for 40 days — until the intended transfer was abandoned. This is the source of several weather proverbs regarding rain on July 15. Rain Day is celebrated in Waynesburg, Pennsylvania, where it has rained 110 out of the past 133 years on July 29. Let’s see if it will rain today! 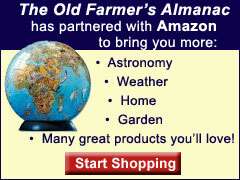 For more fun and unusual events this month, go to The Old Farmer’s Almanac for Kids calendar page. For more astrological best days, go to our Astrological Timetable.